Avian Biology, Volume V is a collection of papers that deals with the biology of birds concerning their mechanics of flight and migration. The first paper describes the mechanics of bird flights such as gliding, soaring, and the energy requirements of this activity. Other papers investigate the control and metabolic physiology of migration, including flight restlessness and fat metabolism. Other topics cover migratory orientation research involving topographical, meteorological, inertial, magnetic, and celestial cues. Upon migration to different environments, birds have to adapt as their circadian and circannual rhythms are affected. One paper discusses the works of Wynne-Edwards, Aschoff and Wever, and Leopold and Eynon regarding their observations of bird migration cues. One author describes the vocal behavior in birds, including the dual sound theory where two sound sources can occur in each bronchus. Of interest to many in this paper is the description of the different stages in song development. Other papers discuss the incubation behavior of birds as well as the energetics involved. 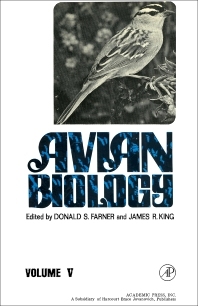 This book is suitable for zoologists, bird enthusiasts, and avian biologists.